Home » » Drug Baron Allegedly Sponsored The Offa Bank Robberies In Kwara, Says Police. Drug Baron Allegedly Sponsored The Offa Bank Robberies In Kwara, Says Police. According to intelligence gathered from cultivated and reliable informant, he is alleged to be one of the sponsors of the robbery attack and the Police Station in Offa. ”Kayode Opadokun, 35 years, native of Offa, Kwara State. He was found to have been released from prison three months ago after serving only eight months of his sentence years for armed robbery. 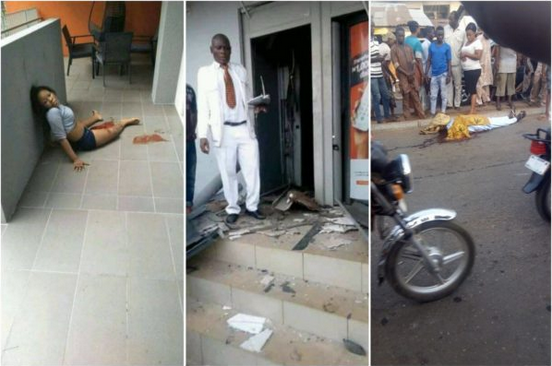 A notorious armed robber and confirmed gang member of the Offa bank robbers, a Barretta pistol and six rounds of live ammunition were recovered from him, and he has admitted to the criminal roles he played in the Offa banks robbery. “Alexander Reuben, 39 years, native of Isoko LGA Delta State. He is a notorious, deadly and hardened bank robber from whom GMPGs, rocket launchers and several rifles were recovered in 2015. He was released from Prison in December 2017. He was arrested on the 11th April, 2018 in Lagos. “Aminu Ibrahim, arrested in Ilorin; Richard Buba Terry;and Peter Jaba Kuunfa. These three suspects in whose possession another Beretta pistol and Fourteen (14) rounds of live ammunition were recovered, were arrested in connection with the Offa bank robbery.